I have never had any complaints when I make Mini Bison Bacon Cheeseburger for my family. Nope. Not a one. In fact, they almost get giddy when they see them coming. I first bought bison as an experiment. Here in Southern California, we are surrounded by popular theme parks, tourist attractions, massive amounts of houses, apartments and businesses with freeways connecting it all together. Buffalo are one of the farthest things from my mind. BUT, when I saw the meat in the store, I knew my family would be game to try it. I had to do a little research to figure out just what to do. What I found was to treat it like ground beef. Making burgers was the obvious choice. And when I say obvious, I mean the food that would seem the most “normal” to my family. Into my ground bison, I add the following: Chopped onions, chopped garlic (I use one clove, but I’m a garlic whimp. Use more if you like it), a dash of Worcestershire sauce and some salt and pepper. Mush it all together. I then divide the meat mixture into 8 mini burgers. I do this by making a ball of meat in the bowl, and breaking that in half. Then I break that in half, and then break those halves in half to form the mini burgers. One pound of bison makes us exactly 8 mini burgers – that’s two per person in our home. And they must all be the same size or someone will surely notice. Once they’re all formed into perfectly sized patties, I take them out and grill ’em up. Top them off with some cheese and bacon, and add the condiments that you like. I added a little mayo and ketchup. I chose to have mine open faced on a mug-bread. If you want that recipe, it’s linked in another post here. Add a side salad and you’ve got a complete meal! Are you familiar with Bison? 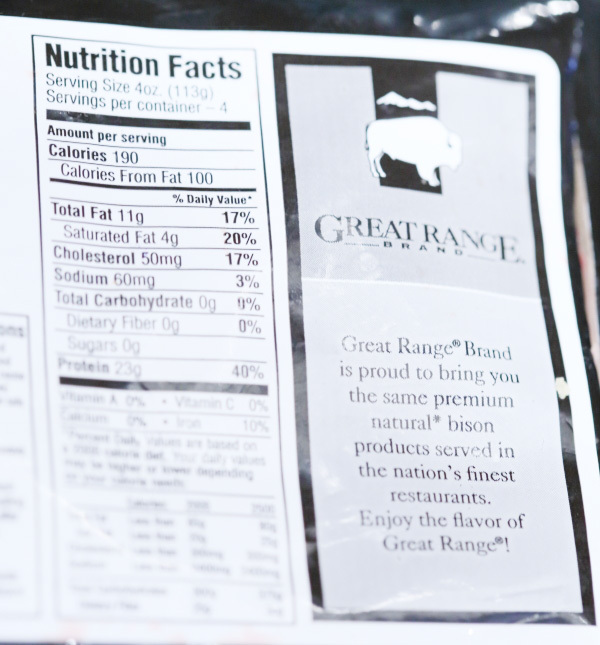 If you’re not, here are a few facts for you on the Great Range Bison webpage. And here’s the nutritional label from the package. Bison is a permanent fixture in our home. Trim Healthy Tuesdays at Stacy Makes Cents and Gwen’s Nest. Wellness Wednesdays at Intoxicated on Life, Raising the Barrs, Back to the Source & Nourishing Treasures. What is your family’s favorite less- than- ordinary food? Leave a comment and let me know!